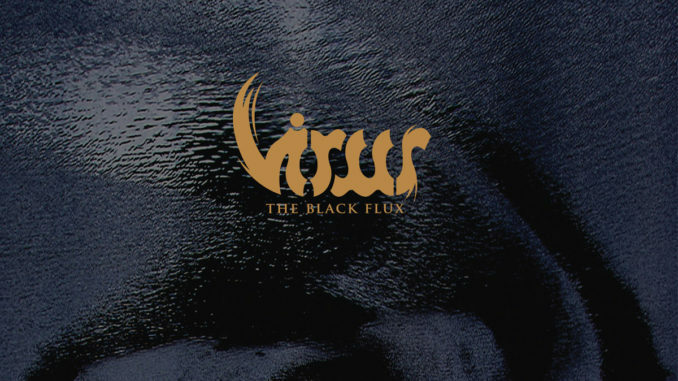 Virus’ The Black Flux could be held up as a defining example of avant-garde music. There is almost nothing catchy about this album. In short, it’s an acquired taste. Flux is the band’s sophomore effort. It shows a maturing of the band dynamic and of the songwriting. It’s always nice when a new band that has a good freshman album can top it with album #2. As an album, Carheart jumps around a bit and meanders; Flux is more of a complete, solid album with one consistent theme. Carheart is a little easier on the ears; Flux is more demanding of the listener. It’s meant for the more mature metal fan, probably because it’s not exactly metal, and yet heavier than rock. Some elements of Carheart do come back on Flux, but they’re done differently enough that it’s acceptable. For example, the opening riff on #3, Archives, is similar to #3 on Carheart, Queen of the Hi-Ace. Guitarist Czral likes to begin riffs with dissonant chords that descend in a medium-fast sweep. Though similar, those two riffs accomplish completely different things. Virus took what worked on best on Carheart and focused on it more specifically on Flux, and then manipulating it into a new beast. Flux is comprised of moments of desperation, anxiety and introspection, and there is no sugar coating. It’s direct and uncompromising, but not overwhelming. Listening to the album in its entirety for the first time, it often annoyed me; I could not figure it out. I wanted to get pissed off at it, but the album’s not heavy enough to invoke anger. That’s not what Virus is going for. There are all these weird riffs, and the singing is weird, too. But what I’m calling weirdness can also be called the band’s originality. I realized this as soon as I popped the CD in the very next day for a second listen, when I appreciated it much, much more. #6, Inward Bound, was one of those songs that annoyed me. The timing, the melody, the vocals, the bass—all of it together, doing what it’s doing, was very hard for me to wrap my brain around. But I really like it now. It makes sense, even if I wish Czral would have sang the pitches more accurately at some points. There’s too much variation in pitch; he goes out of tune sometimes. However, I could also call that a boon, since it adds to the feel of the song. See? Every time I try to find something I don’t like about this album, I find a reason to like it! I will say that this album’s greatest weakness is when the vocal lines do not feel complete, as if they’re floating in space. It happens occasionally, like in #8, Shame Eclipse. #7, Lost Peacocks, is turning out to be my favorite song, along with the album closer, #9, Strange Calm. Czral’s baritone crooning on Peacocks really lends itself to the guitars that are usually pitched higher than his vocals. The song starts out fast and cool—a desperate, rising melody repeated in weird timing. Then he sings over it, his croon really low and baritone, and it all works very well together. His voice sounds like a trio of monks in on some cosmic secret the rest of us don’t know about, prophesying some sort of epic worldly destiny. Beware the hilarious bridge riff. The opening guitar line on Calm is my favorite riff on the whole album. The bass does something weird under it that I did not hear on my crappy laptop speakers before I brought the album home. It’s worth many listens; it’s a complex riff. The bass both follows the guitar line and does its own thing. Very hard to dissect and avant-garde as hell. I give Flux four stars out of five; it’s a great album. See also Unwound’s Leaves Turn Inside You, the trio’s final effort. Where they began as a noise rock band with edges of Sonic Youth and traces of At the Drive-In’s better moments, they became something more like what Czral, Einz and Plenum are doing on Flux. Not as heavy, but striking the same avant-garde tones with more whispered lyrics.